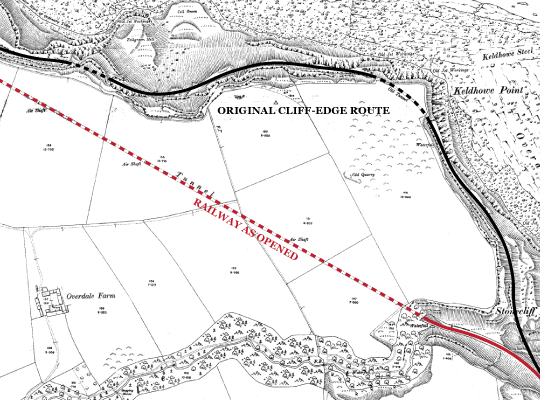 Without any doubt at all, the decision to initially construct the line around the cliffs between Sandsend and Kettleness was not only a major mistake, but the cause of the line’s failure. Nevertheless a considerable amount of work was done on the various tunnels as is indicated by Mr Tolmé’s last engineer’s certificate. In that certificate of 20th October 1873 he reports that, so far, £4,681 had been spent on the various tunnels. 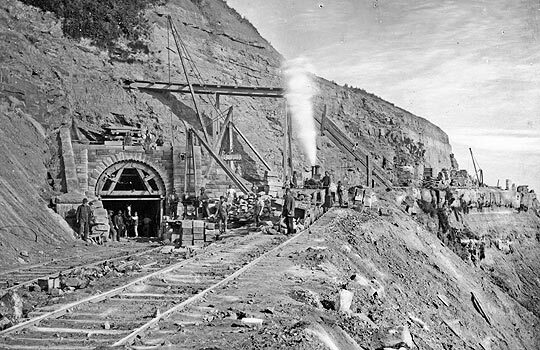 The problems caused by the cliff edge works as well as those at Grinkle tunnel brought the company to the edge of bankruptcy, and resulted in the sacking of the contractor, John Dickson at the end of 1873 and of the Engineer a few months later. It is impossible now to know how much work was actually done (no earthworks of any kind remain on the cliff edge section). However, a more recent historical Ordnance Survey map (before 1923) shows a tunnel at Keldhowe Point on the abandoned section of the line. There is no evidence for the existence of this tunnel other than the map. However, even the major tunnelling works which eventually took place further inland did not lessen the cost. The representations which have been made as to the present position of the WRMURly have occupied the attention of the North Eastern Board and the decision that they have arrived at is that they cannot advise their shareholders to adopt the present line with a view to its completion or to become subscribers to it. The N E Board however are prepared to look favourably on the construction of a line of railway properly laid out to meet the requirements of the district and further, so far as can be done, to adopt such portion of your present line as will be consistent with the construction of such new line and to utilise so far as possible any materials, works, etc. which may be available for the new line paying for the same according to a fair valuation. If your company thinks it advisable to enter into negociations (sic) on this basis you will of course advise the Directors of this company. Central to the demands of the NER was that the cliff edge line be abandoned; clearly it was not, in their opinion “properly laid out”. 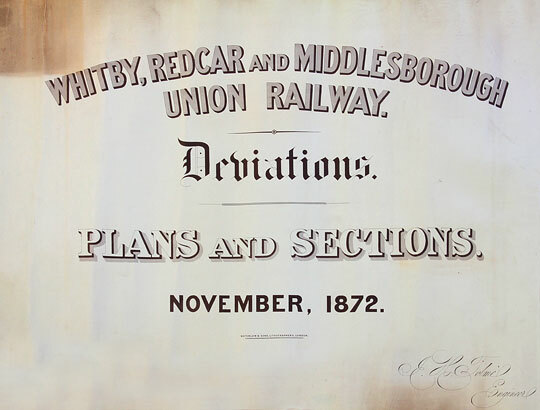 At last in May 1875 an agreement was made, ratified by the Whitby, Redcar and Middlesbrough Union Railway Act of 19th July 1875, between the North Eastern Company and the Directors of the Whitby, Redcar and Middlesbrough Union Railway to complete the line “with all despatch”, and “in a substantial and satisfactory manner”. The NER would find the necessary capital and work the line upon completion. Initially, the idea was for a major deviation away from the coast to be made. This would certainly have been a cheaper and easier option, but the new line was never begun. Interestingly, it would have included a tunnel near Mickleby of 525 yards in length at an estimated cost of £13,650. The cliff edge section between Stonecliff End and Holmsgrove was indeed abandoned, but the deviation line inland was never built; instead, a tunnel of length 1,652 yards was built which by-passed the cliff edge line and ran from Deepgrove to Holmsgrove where it emerged for a short section in the open air before entering another - Kettleness - tunnel. It is likely that the North Eastern Railway (with, no doubt, the agreement of the WR&MUR) considered that too much had already been invested in the line to make such a major deviation, or, more likely, that the additional new cost would not be recouped by savings in working or maintenance. The Directors’ Report to their shareholders of 22nd February 1876 clarified the position: “As provided by the terms of the Agreement, the North Eastern Company has applied in the present session for powers to make a Deviation of the authorised line, and the Bill is about to be submitted for your approval. The deviation is less extensive than was proposed last Session, and substitutes for the line along the cliff about a mile and a quarter of railway almost all in tunnel.” On the 13th July 1876 powers for the deviation of the line through what was then known as Deepgrove tunnel (and for the abandonment of the partly constructed works along the cliff top) received the Royal Assent. 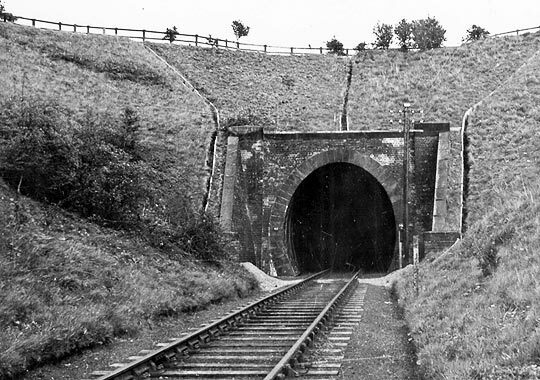 The North Eastern Railway had immediately recognised the main problem, but its expensive solution (the construction of Deepgrove tunnel) was to become an important contributory factor for the line’s financial difficulties throughout its life and, indeed was, as will be seen, to be the immediate cause of its closure. Construction work at Grinkle tunnel. A scene of great industry at the south end of Kettleness tunnel. The North Eastern Railway spent a considerable amount of money on the construction of the three tunnels on the line. The final cost for the line amounted to £655,077 of which the NER contributed well over £350,000. This high cost was due almost entirely to the need to improve the viaducts, to build or complete the tunnels and to make all the improvements so clearly delineated in the Harrison memorandum. Nevertheless the final product reflected the money spent upon it. 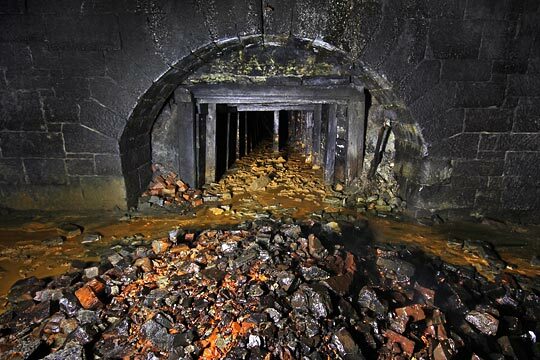 Visual evidence, showing the interior of the Sandsend (Deepgrove) tunnel over 120 years after its construction and 50 years after its abandonment shows a very solid and well-built structure. 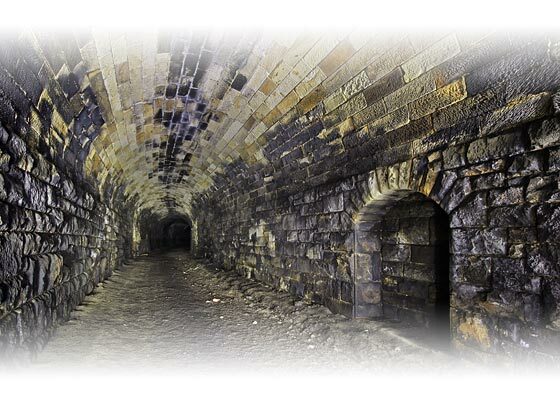 Indeed, so well-built were the tunnels that there is very little reference to them in the three formal inspections carried out by the Board of Trade in 1883, thus indicating that they were not a cause of any concern for the inspectors. 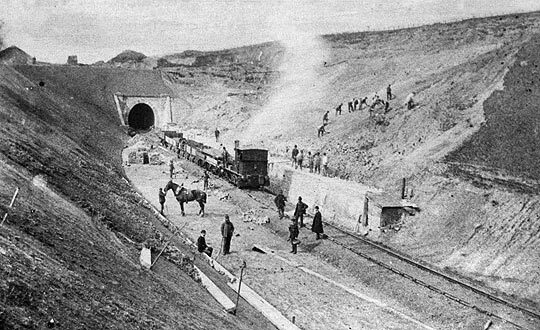 There were two slightly unusual elements in the construction of Sandsend tunnel. Two adits or spoil tunnels were constructed so that some of the excavated material could be taken right to the cliff edge and easily dumped onto the rocks below. The shorter of the two adits that were driven to assist with the tipping of spoil from Sandsend tunnel. In the foreground is debris from a shaft. The line was difficult to work. 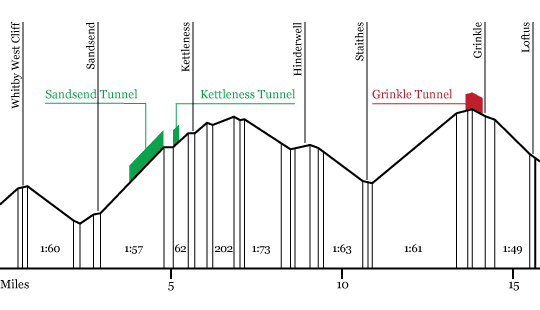 The gradient map shows the many steep rises and falls between Whitby and Loftus. 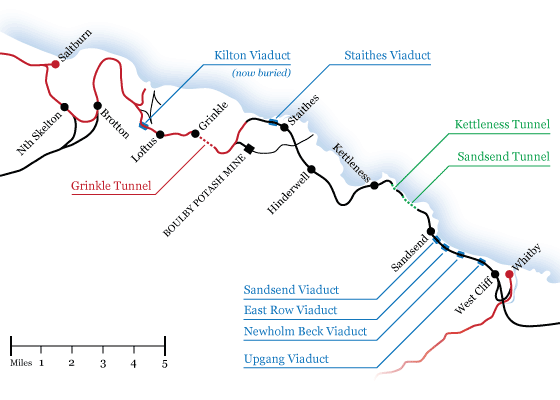 Especially difficult for train crews was the 1 in 57 bank from Sandsend to Kettleness (with a short stretch of 1 in 62). Most of this steep climb was through Sandsend tunnel; it is not known whether any ventilation shafts were built at the time of the construction of the tunnel, but there is evidence to show that by 1895 there were two in existence. These were not enough and it was decided to ease the difficulties for the drivers and firemen labouring up this difficult stretch of line. Although there is no direct evidence, complaints from the train crews must have been regular enough and loud enough to make the NER construct three new shafts. Detailed plans of these exist in the National Archives. They were built in 1900. 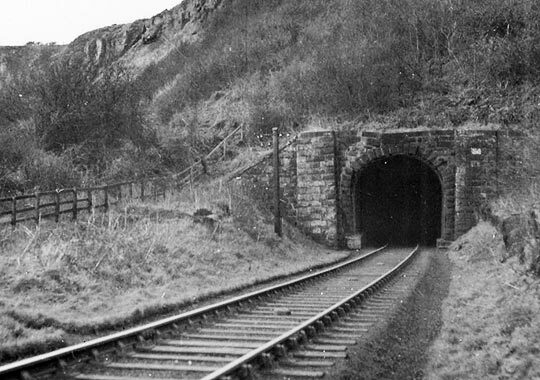 As far as the primary sources are concerned, the tunnels pass out of history until September 1957, when the announcement was made that British Railways were to close the line. The ostensible reason was the cost of immediate and future maintenance, it being considered that £57,000 needed to be spent, mainly on the tunnels and viaducts, in the next five years. This, plus the limited income from the very few passengers that the line carried, was a difficult argument to counter. 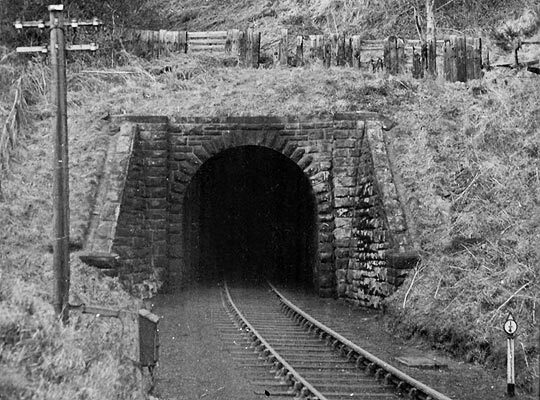 A glance at the north portal of Sandsend tunnel shows the distortion of the brickwork and the out of alignment tunnel mouth. This photograph was taken c.1956. British Railways were sufficiently alarmed by the inherent danger of the situation that they put in place temporary repairs, reinforcing the misshapen brickwork with steel rails. However, while maintenance problems were absolutely necessary, it is more likely that the demands of the 1955 Modernisation Plan had more to do with the closure of the line than the (admittedly large) expense of maintaining the tunnels and viaducts. When the line closed to all traffic on 5th May 1958 (the last trains running on 3rd May) the tunnels were left to the vicissitudes of time and weather. 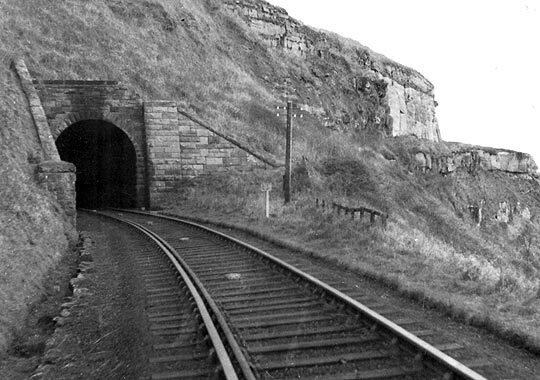 However, as has been noted, so well-built were they that well over 50 years later the interiors of Kettleness and Sandsend tunnels are still in good condition, except for the collapse at the north portal of Sandsend. Access to the south portal of Sandsend tunnel is straightforward, as is the north portal of Kettleness tunnel, but the respective north and south portals of these tunnels can only be reached by passing through the tunnels, as the track bed on the cliff face at Holmsgrove is totally inaccessible. While the ventilator shafts of Sandsend tunnel exist, the exits in the fields above have been capped, and there is now no sign of them.